The Ferret Association of Connecticut has one of the largest repositories of ferret information of any shelter in the United States. 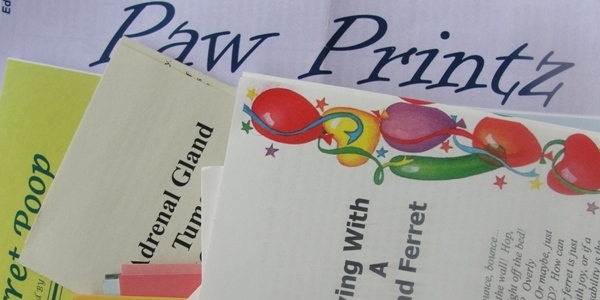 Between our newsletters, brochures and articles, FACT has published hundreds of pages of unbiased ferret behavior and health information in the past two and a half decades. While treatment protocols and the specifics of health care may change over time, the symptoms of illness do not. Neither do the proven methods of dealing with certain types of behavioral issues. Ferrets are natural charmers! Fun, curious, mischievous. But sometimes they also have bad habits. Here we deal with the good, the bad, the not-so-good and the sometimes puzzling behaviors of ferrets. Food, water and housing – these are the basics that all animals need. To understand what health care ferrets need, including vaccinations, please review the Heath section. Ferrets are no more prone to health problems than dogs, cats or other companion pets. However, there are certain illnesses and problems that are specific to the species. Also, because of their relatively short life-span (on average, 5 to 7 years in the United States) and small size, they need to have far closer attention paid to their health. FACT recommends that ferret owners try to schedule two vet checks annually. Keeping your ferret safe is challenging as they are naturally curious. Sometimes you need to look beyond the obvious.